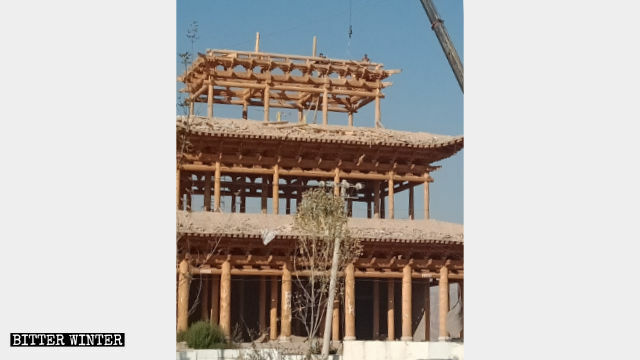 By halting approvals for houses of worship, which are required by the Chinese government, more Buddhist and Taoist temples are being shuttered. The Chinese Communist Party (CCP) is taking a new route in continuing its campaign against religion: Requiring that permits be held in order to worship – and then refusing to grant them. 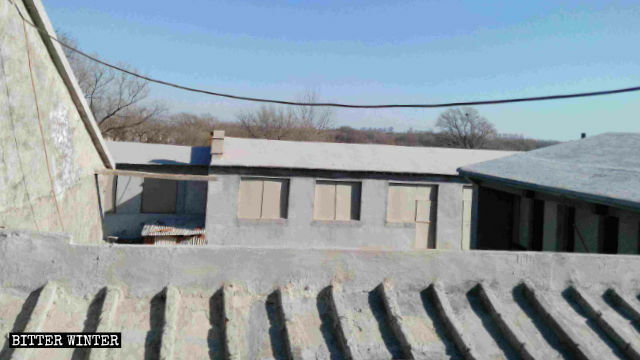 One local government insider in Xinzheng city of the central province of Henan revealed that the authorities’ intentional withholding of permits is related to the CCP’s policy of drastically reducing the number of religious venues to curb the spread and growth of religion. Local governments across China are taking similar steps in suspending the activities of Buddhist and Taoist temples. The newly-constructed Jade Emperor Temple. According to sources, this temple was located on the builder’s own land. And when it was first built, it had obtained the consent of the local government. The Jade Emperor Temple in the process of demolition. 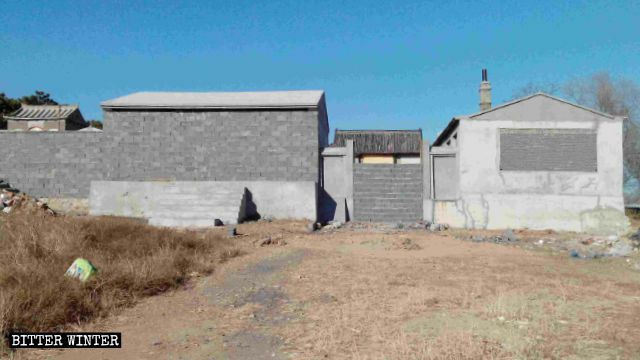 Buddhist Lingyan Temple in Huludao city of Liaoning Province in northeastern China was also sealed off for the same reason. Lingyan Temple’s main entrance has been sealed off with bricks. On October 12, 2018, government officials ordered personnel to seize all the Buddhist items inside the temple and to seal all the doors and windows with plasterboard. The red pillars were painted with black paint. And the temple’s entrance was completely sealed off with bricks. 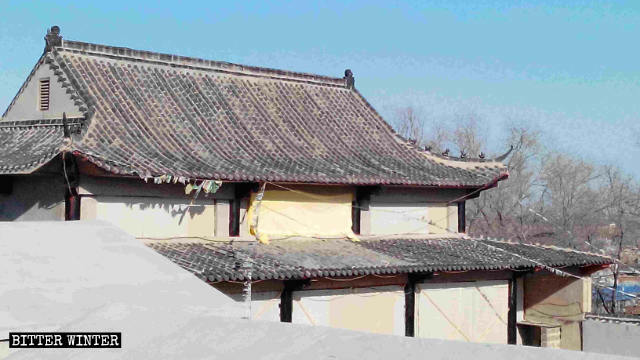 The windows of the Lingyan Temple have been covered with plasterboard. 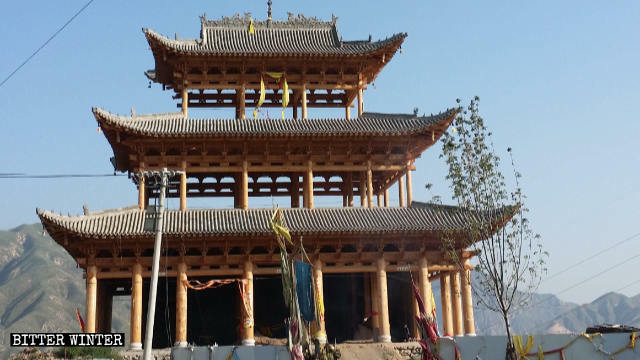 The temple was built with 2.8 million RMB (about $417,900) in funds collectively raised by the temple’s owner and local villagers. A period prior to the temple being sealed off, the owner had requested that the authorities issue a permit for the temple, but government officials never did so. Yellow cloth covers the signboard of the Lingyan Temple. One local villager said the government doesn’t allow them to burn incense or worship Buddha, so surveillance cameras have been installed on the side of the road leading to the temple, and anyone who is caught going to this temple for worship will be punished. This situation isn’t limited to Buddhist and Taoist temples alone, either. As Bitter Winter previously reported, many Christian and Catholic religious venues have applied for permits for years on end. Some of them have been applying for as long as 20 years.